Car Information: THIS CAR HAS BEEN SOLD ! LET HIGHWAY ONE CLASSIC AUTOMOBILES GET YOUR CLASSIC SOLD Flathead V-8 Motor with Manual-3 Speed Transmission Black with Tan Interior Just in time for "Woodies on the Wharf". 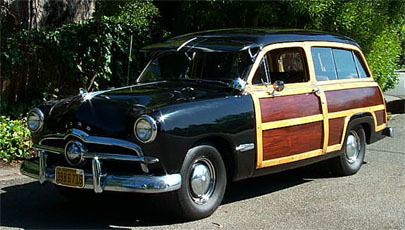 Let's go surfin' in a great '49 Ford Woody Wagon. Survivor quality. Very good original condition. Rare options include factory black paint, sun visor, factory spotlight, third seat, sliding rear windows, original radio, and period license plates! Runs strong and reliable. Excellent wood, shiny paint, excellent interior. It's all there! Restore to perfection or drive respectable history.